Mark Your Calendars: Fresh Pasta Workshop October 13 at 12PM... Live in NYC! Class starts at 12 pm, and includes a full Italian lunch; the cost is just $110 per person. Reserve here before class sells out. Barley (farro in Italian) is a staple in central and northern Italian tables, often cooked into creamy risotto-style first courses. The trick is long, slow cooking, constant stirring, and the gradual addition of hot stock to the barley as it cooks... exactly the same as for risotto. 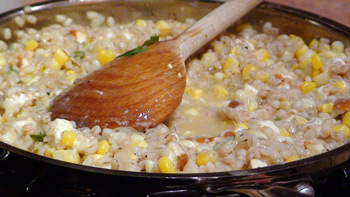 Make the risotto: Heat the broth in a stockpot and keep it hot. Heat the olive oil in a wide, shallow pan. Cook the leeks until soft and translucent, stirring often with a wooden spoon, about 5 minutes. Stir in the barley and thyme, and season with the salt and pepper; cook 3 minutes, stirring constantly. Deglaze with the wine and let it evaporate, stirring, about 3 minutes. Begin adding the heated broth by the cup, stirring constantly; add more broth only when the barley has absorbed most (but not all) of the broth in the pan. Cook the barley in this manner, adding broth as needed, for 40 minutes, or until it is al dente; you may not need to add all of the broth. Fold in the corn kernels and Pecorino, and adjust the seasoning as needed. 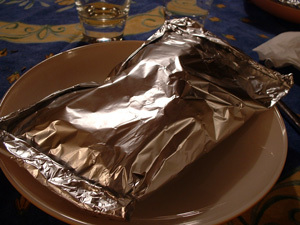 Grilling food in foil seals in moisture and intensifies flavor; it also looks spectacular on the table. You can substitute lamb chops, veal chops, or fish steaks for the chicken breasts if you like. Preheat a grill to a high flame; if you don't have an outdoor grill, use a grill pan instead. Combine the cherry tomatoes, capers, olives, garlic, shallots, rosemary, thyme, sage leaves, salt, and pepper in a bowl. Don't think of the stockpot as a bubbling garbage bin. 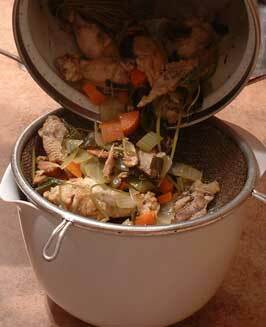 If you put rotting or flavorless ingredients in the stockpot, your broth will taste rotten or flat. Use leftover diced onion, crushed garlic, even a lonely tomato half for the stockpot as long as they're flavorful and fresh; you might want to keep a bag of vegetable trimmings in the refrigerator for use in your next broth, a way of cutting down on waste and making a richer broth. Don't cook the broth at too high a temperature; once it has reached a boil, lower the heat and let it simmer slowly for a long time (anywhere from 2 to 24 hours). High temperatures cloud the broth. Remember to skim off surface scum once the broth comes to a boil to avoid making the broth cloudy. Don't season broth with salt and pepper. You never know how much you'll be reducing it, or in what recipe you'll be using it. Use the recipe below as mere guidance. If you like the taste of tomatoes in broth and don't like carrot, substitute the one for the other. What counts is balance between the meat base and the aromatic and vegetable flavoring base: a chicken broth should taste like chicken, not carrots or thyme or onions. When you intend to freeze broth to be used in sauces, reduce the broth to one-tenth of its original volume and pour it, once the fat has been skimmed off, into ice cube trays. Once the broth is frozen, empty the trays into a plastic freezer-safe bag. Whenever you need broth, defrost one or two cubes and dilute with enough water to bring the broth to the right potency. 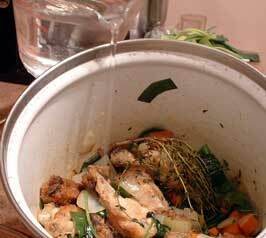 Place all the ingredients in an 8-quart stockpot, add enough cool water to cover by 2 inches, and bring to a boil. Lower the heat to medium-low and simmer for 2 to 24 hours, skimming the surface with a slotted spoon every 30 minutes or so. The longer you simmer the broth, the more reduced it will become and the more intense its flavor will be; intensely reduced broth is ideal in sauces, but may need to be diluted somewhat for use in soups or risotto. 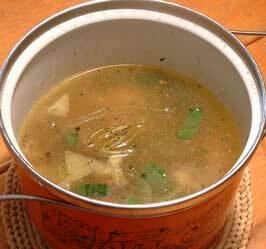 For a recipe for brown chicken stock, click here. Food tastes different depending on when the seasoning is added. Seasoning blends in better when it is added to a simmering dish rather than just sprinkled over a finished dish. In the case of raw foods (salads, dressings, marinades, and so on), toss or stir gently to incorporate the seasoning. Always season from high up--at least 6 inches above the food. Grab the amount of seasoning you want between your thumb and index finger and let it rain gently down upon the food. Never drop the seasoning right onto the food without distributing it evenly: you will end up with food that tastes salty in spots and bland in others. Always taste for seasoning just before serving a dish. Adjust if needed, and enjoy. A shopping list is key to quick shopping and helps you cut down on frivolous, hunger-driven expenses and minutes spent wandering up and down the aisles scratching your head, trying to recall just what it was you came to buy. Make your shopping list based on what you'll be cooking that week or what you've actually run out of, and you probably won't find yourself throwing away or wasting any food come the end of the week. When you're writing a shopping list, begin by subdividing it by store. Make one list for the supermarket, another for the butcher, another for the fish store, or for whatever other shop you'll be going to; this way you cut down on the possibility of coming back home without one of the items you had originally set out to buy because you lost track. If you only shop in one store, it's that much easier. Subdivide each list further by departments within each store. If you usually shop in the same stores, you know them pretty well, and you have a mental image of what the aisles contain and how the food is displayed. You know the dairy case is the first thing you see in the market next door, followed by the vegetables, then the prepared foods and so on. Group the items on your list in the same way they will actually appear in the store, and you'll save time once you're actually in the store. When you've finished in one store, check your list for the items you didn't find; put those on the list for the next store, or find a substitute if you think you won't be able to find them. And finally, you may want to consider keeping a running list of what you have run out of at home--jot down what you need to restock as soon as the need presents itself, and you will rarely find yourself forgetting that essential item the next time you head to the store. This is a question that generates much impassioned debate in the food world... Here's my point of view. Salt raises the boiling temperature of water, making it take longer to come to a boil. I find salted water that has cooked for a long time takes on a mineral-ey taste. If the boiling salted water reduces and reduces (by evaporation, for instance if you forget the pot on the stove), then it might be too salty by the time you add your pasta or vegetables, and your pasta or vegetables might emerge too salty as a result. Most Italian recipes begin with a flavoring base called soffritto (roughly the equivalent of France's mirepoix, but far more varied from region to region and town to town). Literally translated, soffritto means "slowly fried," from the word fritto ("fried"). Soffritti are composed of all sorts of savory ingredients: aromatic vegetables (carrots, onions, leeks, celery, garlic, and others, in varying combinations), as well as fragrant herbs (be it rosemary, parsley, mint, thyme, sage, oregano, basil... the list goes on and on) and flavor boosters (Pancetta, bacon, anchovies, chili peppers, and more). These ingredients are very finely minced (usually with a half moon-shaped rocking blade called a mezzaluna, or with a simple kitchen knife) before they are cooked to luxurious tenderness. The skill of the cook and the beauty of Italian cooking lies in the various combinations these ingredients take on; a flavorful soffritto is often the key to a delicious final dish. Soffritti need to be cooked slowly in a bit of hot fat (extra-virgin olive oil, butter, or lard are the three Italian classics) before other ingredients are added, creating a layering of tastes and a complexity of flavors that constitute the true heart of the dish. If you rush the soffritto, you'll end up with a dish that tastes flat; so take your time and let the aromatic ingredients release their essence in the pan. Here are three recipes that highlight the use of soffritto in Italian cooking. Happy cooking! I like to use a combination of chanterelles, morels, and oyster mushrooms to make a robust mushroom and cheese calzone. If you can get your hands on fresh porcini mushrooms, they are divine in this dish. 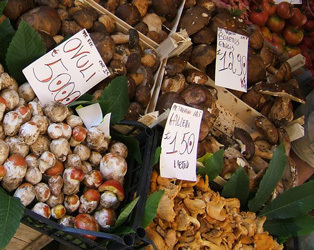 The soffritto for the mushroom filling combines garlic and parsley, which bring out the best in mushrooms. 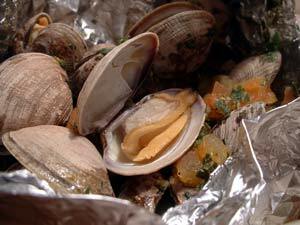 Italians enjoy seafood like clams in bianco (white) or with tomatoes. Either way, a bit of white wine is usually added to lend acidity to the dish, and garlic and parsley frequently make an appearance in the form of a soffritto at the onset of cooking. Serve the clams below on their own, with grilled bread to mop up the juices; or serve with long pasta as a satisfying first course. I prefer to use cockles (a New Zealand bivalve) rather than clams since cockles are smaller, sweeter, and more similar to Italian vongole (clams); look for cockles in well-stocked seafood markets or use littleneck clams if unavailable. A few years ago, when my husband and I were in Tuscany, we stopped for lunch at an unassuming roadside trattoria near Lucca. There was no menu: only the owner, making his way from table to table, enticing diners with descriptions of the day's offerings while his wife and mother cooked in the tiny kitchen. 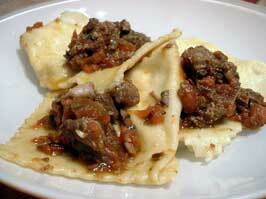 Among the homemade pastas, we ordered cheese ravioli in duck ragu... one of the best primi I have ever sampled. The duck was absolutely tender, not at all fatty, with a hint of fennel seeds that brightened the dish. Unlike many duck ragus I have eaten over the years, this one was barely red--only enough tomatoes to give the sauce body and sweetness, not so much as to mask the taste of the meat. A delicate dusting of sharp Pecorino rounded out the flavors. Although I wasn't able to get a precise recipe from the chef that day, I swore I would try to replicate the ragu at home in New York City. After a few tries, I finally got just the right balance of flavors. My duck ragu was as good as the one we had enjoyed in Tuscany--well, almost! I love the ragu tossed with Ricotta-filled ravioli, but it is also delicious with a simple fresh egg pasta; pappardelle or tagliatelle are perfect. I suggest you make a double or triple batch and freeze some so you can enjoy it later. Invite your most discerning guests to dinner, open a bottle of Rosso di Montalcino, and indulge in a taste of Tuscany without ever leaving home. The soffritto for this heavenly ragu features onion, carrot, celery, Pancetta, bay leaf, parsley, thyme, and basil. By this I mean a big (at least 12" by 8") dishwasher-safe cutting board. I prefer having at least two or three, so I can use one for meat or poultry and another for vegetables without having to wash them in between. An additional tip: place a wet paper towel under your board on the counter to prevent slipping. It can be difficult at first to get used to a big chef's knife, but once you've got the hang of it, you'll never go back to ordinary kitchen knives. Choose a good quality, solid, heavy knife, preferably high carbon stainless steel (it won't rust and can be sharpened at home with a sharpening steel). Look for a knife whose blade and handle are forged from one solid piece of metal. You can tell by looking at where the two meet: there should be rivets attaching the blade to the handle. Avoid knives with a space between the handle and the blade: harmful bacteria can collect and multiply there. Store your chef's and other knives in a wall rack or, if space allows, a standing rack on the counter where you do prep work. Never wash good knives in the dishwasher; not only is it potentially dangerous when you retrieve them, it may dull the blade. The blade varies in length and width, but an 8" blade is suitable for most purposes. Use the chef's knife to cut, slice, chop, mince, dice, julienne, or cube vegetables, meat, fish, cheese, herbs, even bread. The wide blade is useful for flattening vegetables (a garlic clove, stalk of lemongrass, or cube of ginger, for instance), and transferring food from the cutting board to a pot or other surface. It's the handiest knife there is, as long as it's kept sharp. I especially love J.A. Henckels knives, and those are the knives we use at our NYC cooking school. A small knife ideal for peeling and trimming vegetables; good for peeling onions, removing the stringy fibers from celery stalks, and so on. The blade is about 2" to 4" long, and straight. Again, look for knives from J.A. Henckels. A long rod that fits snugly into a knife rack, a sharpening steel allows you to keep your knives sharp. Despite what you might think, sharp knives are less dangerous than dull knives: dull knives tend to slip and can easily land on you rather than on the food as you make more effort to do the job. To sharpen a blade, hold the knife against the steel at a 20 degree angle, and quickly draw the knife along the steel on one side, then the other. I like using small bowls to keep sauces and chopped ingredients by the stove once I've readied them. I have a whole selection of bowls, mostly small custard cups or ramekins and little glass bowls; they take up little room on the counter and in the dishwasher, and keep everything organized as I cook. Buy little bowls in a variety of diameters: I find 2", 3", and 4" are the most useful. The same idea as the small bowls, except that these take up even less room in the dishwasher since they're flat. They're good for holding minced garlic, minced ginger, diced onion, and so on as you cook. I don't like wasting my time in the kitchen cleaning up. I choose stainless steel bowls, whose smooth surface is easy to clean up, for tossing greens with a dressing before distributing them on dinner plates, allowing dough to rise, marinating meat, and so on. They go in the dishwasher, but if there's no room, they take virtually no time to wash by hand, unlike some prettier glass or ceramic bowls. If you buy a set of bowls in varying sizes, the added bonus is that they are stackable. I can't say enough about this miracle machine. I love my food processor. It really is the busy cook's best friend. Choose one with a 7-cup capacity or more; this will allow you to make bread dough, pastry dough, and large quantities of sauces, pestos, and purées in one batch, thus saving on time. I make many of my bread and focaccia doughs in the food processor; for an easier clean-up, I make sure I use cold water to soak and wash the bowl, because hot water makes glue out of flour that's been left behind. I also make stuffings for pasta, pestos, and purees in my food processor. And the slicing and shredding disks are great for vegetables, fruit, and cheese. No matter how fast you are at slicing and dicing and mincing, even if your fingers fly above the cutting board and you're a blur of motion, you can never be as fast as a food processor. I urge you to invest in one of these if only because of the dishwasher room you'll save; no need to haul out the large machine for the small jobs. I have a handy 1-cup food processor sitting in my kitchen, and I use it for emulsified dressings, herb marinades, small quantities of pesto or sauce, even for grinding nuts to a fine or coarse powder. The work bowl takes no more space than a glass in the dishwasher. I rarely use my blender, and find that the food processor does everything the blender does, and more. But once in a while, I do pull it out to purée soups or make a pesto. If you need to crush ice often or like an ultra-smooth texture to your puréed soups or sauces, you will find a blender useful. In Italy (actually, all over Europe), cooks use scales to weigh food; they don't rely on volume measurements, and I think they're right. Weight is a consistent measurement, whereas volume is inherently error-prone. In other words, my 1/4 cup of flour may be more or less packed than your 1/4 cup of flour, and my cake batter may turn out too wet as a result. But if I weighed my flour instead, and you did too, we would be sure of a consistent measurement. At our NYC cooking school, we use an electronic scale. When you're dealing with recipes, you're often dealing with ingredients by the tablespoon, by the 1/4 cup, and so on. Buy one set of measuring spoons and one set each of liquid and solid measuring cups; but also be sure to buy a scale (see above). 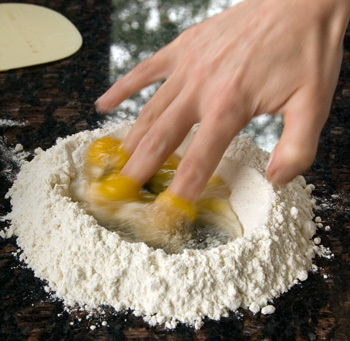 A rolling pin makes short work of rolling out a dough for pizza, stuffed focaccia, and sweet or savory pies. It's also a good tool for crushing nuts or spices (as long as they're in a plastic bag or kitchen towel). I have a number of nonstick baking sheets in different sizes. They're not only good for baking focaccia and pizza, toasting bread for crostini, but for holding food as you prepare it. When I make stuffed pasta, gnocchi, or dumplings, I place each on a baking sheet as it is ready ( a light sprinkling of flour or a sheet of wax paper comes in handy to prevent the food from sticking). I also freeze food (from cookies to ravioli) on baking sheets, and once it's frozen, I transfer it to plastic bags or containers). They're like an extension of your hands. Tongs are ideal for tossing salads, turning fish filets or scaloppine in a hot pan, retrieving bits of food that slipped out of the pot and onto the burner, pulling ears of corn out of boiling water, and anything else you can think of. If my husband isn't home, I use tongs to grab packages of pasta from the top shelf in the kitchen cupboard, which I can't reach without standing on a chair. Buy tongs in stainless steel, not plastic, so they will be heat resistant. But don't forget, they heat up if you set them on the side of a pan to rest, so be careful. A time-saver when you make salad often. A salad spinner allows you to thoroughly dry large quantities of salad or greens (spinach, arugula, watercress, and so on) in seconds. The added advantage, beside the speed and lack of effort, is that washed and very thoroughly dried greens or salad leaves can be kept fresh in a bowl, covered with a slightly damp towel or kitchen paper, for a day or two in the refrigerator. I have dozens of wooden spoons of varying lengths and sizes, and love them all. They are wonderful because they do not scratch pots and pans, and there is nothing like a wooden spoon for stirring risotto: its rounded shape is ideal for snuggling into the pot's corners, ensuring every grain of rice gets evenly cooked. I use a metal spatula for stainless steel pots and pans, and a plastic spatula in nonstick cookware. Plastic spatulas are also good for flipping frittatas, omelets, and anything flat (like a chicken breast) in a pan, for transferring baked items to a platter, or for serving hot food like pies, lasagna, or pasta gratins. This is the spatula of your dreams when it comes to removing every last drop of sauce from a bowl, pot, or food processor. If you hate wasting good food just because your spoon won't reach in the crevices of a receptacle, the rubber spatula is the tool you need. It's also ideal for folding beaten egg whites or whipped cream into a batter or purée. And I can't stress this enough: when you choose a rubber spatula, test it to see how flexible it is. If it's stiff, don't buy it. A soft spatula will marry the sides of any surface it comes into contact with. Otherwise why bother with a rubber spatula in the first place? There really is a difference from manufacturer to manufacturer. Buy a few different sizes, widths, and lengths, each of which will be better suited to different containers. Fundamental when making gnocchi, when deep-frying food, and when skimming homemade broth. Whether you buy plastic or stainless steel serving spoons, buy more than you think you need: three or four is a good number, so you'll always have a clean one on hand. Look for spoons with deep cavities (or bowls); the flatter the spoon, the harder it will be to serve. Remember not to use metal spoons on nonstick surfaces, or they will scratch. A must when draining pasta (unless you have the sort of pot with its own built-in strainer). Also good for rinsing fruits and vegetables, washing herbs, and draining steamed or boiled vegetables. Look for a colander with many holes for fast, even drainage. Good for crushing garlic with salt to break down the fibers (it really is more digestible crushed than minced), or grinding peppercorns and spices (unless you buy an electric coffee grinder and use it as a spice grinder). Choose a mortar and pestle made of marble, which retains less odors and flavors than wood, and is heavy enough not to slide all over the counter as you exert pressure. Not only useful for cheese, but for carrots, ginger, and onions. I like graters with holes of varying sizes, and prefer stainless steel to plastic, since it retains less odors. This handy tool is perfect for grating garlic, ginger, cheese, citrus zest, nutmeg... the list goes on and on. I prefer Microplanes with a rubber handle to those without handles. Try using the peeler on more than just potatoes: cucumbers, zucchini (keep the ribbons of peel: they're succulent sautéed with garlic, chili, and lots of black pepper in a little olive oil), even pears for a salad. I prefer those with a fixed, rather than rotary, blade, because I feel they allow me more control over the food. If you intend to bake bread or pizza, this is not a luxury: it's a necessity. Some ovens, such as the Wolf electric ovens we have at our NYC cooking school, even come equipped with pizza stones and a special pizza stone setting. Baking stones, which are available in most kitchenware shops, transmit and retain heat very effectively. They make bread crust crisper by quickly drawing out the humidity from a loaf, and give bread a dark, burnished crust. Bread baked on a stone is more rustic, toothsome, and honest in flavor than bread baked on a baking sheet. Baking on a stone mimics a brick oven and really cuts down on baking time; a pizza that would take 12 minutes to bake without a stone takes 5 minutes with a stone. To use a baking stone, preheat it in the oven for at least 30 minutes at the desired baking temperature: 450 degrees for large bread loaves, 550 degrees for pizza (for more on baking stones, click here). Wash the stone without soap, or your stone will take in the soap and transmit the soapy flavor to the bread or pizzas; to remove stuck-on, encrusted food, like cheese from a pizza, use a metal spatula to scrape it off the stone once it's cooled. A single baking stone won't entirely cover a standard oven rack, since standard ovens are larger than most baking stones. To solve this, you can buy two baking stones, leave the first one whole, and cut the second one to the exact size you needed to cover the entire rack. Avoid round baking stones, which have two disadvantages: they're less space-efficient, so you can bake less at a given time; and they exacerbate the possibility of spilling food onto the oven floor, because they don't reach the end of the oven rack. Because of their many tiny holes, liquid flows through mesh strainers in a steady stream. Mesh strainers are ideal for straining purées, soups, and broths without need of a cheesecloth to ensure absence of lumps. Pressing garlic results in a more pungent flavor than mincing, because the garlic's juices are squeezed out and the aromatic oils are extracted by the pressure. Select a self-cleaning press to save on cleaning time and smelly hands. Once you've peeled the garlic, all you need to do is slip the clove in the press, and with one swift motion you have a creamy paste. Especially heavy metal presses make peeling the garlic unnecessary. Pressed garlic can't be substituted for minced garlic, but it's very good in salad dressings, sauces, and marinades. I never press garlic if I intend to cook it, as it has a tendency to burn. By this I mean a coffee grinder put to a different use. If you use a lot of aromatic spices in your cooking, make your own spice pastes and powders, and often prepare dry rubs for marinades, a spice grinder will do the job beautifully. Use it instead of a mortar and pestle: it's faster, easier to control, and a lot less messy (have you ever tried to pulverize a cinnamon stick with a mortar and pestle?). Reserve the spice grinder for spices only: coffee in one, spices in another, unless you enjoy coffee that tastes of cumin. Buy one or the other, or both, depending on your preference. I have both. I like the press better for large quantities of juice, and the reamer for a single lemon or lime. Reamers are usually wooden - sometimes ceramic - elongated tools; a good rinse is all they need before going back in the drawer. The best whisks are made entirely of metal, and have a nice, thick handle for easy grasping. 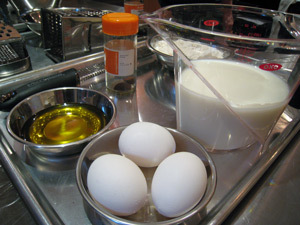 The whisk is indispensable if you're making béchamel or other roux-based sauces, and a handy tool when you're making pancake or crêpe batter (not to mention when you're making zabaglione or other egg-mounted sauces). Good for brushing egg wash over bread before baking, greasing phylo dough as you layer it, and basting meat or fish as it roasts. Look for a pastry brush with well-attached bristles, or you'll end up with hairy food. A few months ago, after I posted a recipe for chicken stock on my site, I received so many emails from readers telling me they had tried the recipe and that it was far superior to anything store-bought. There's nothing quite like homemade stock. 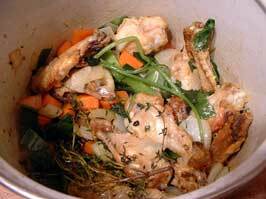 Below is a different yet equally delicious recipe for chicken stock: a brown chicken stock. The technique for brown chicken stock is basically the same as that for white (or regular) chicken stock: bones and aromatic vegetables are cooked in water to cover until all the flavor is extracted from them. But there's one key step that makes all the difference between the two recipes: the browning of the bones before any water is added. Browning the bones not only develops a darker color in the stock--it lends it a deeper, earthier flavor. Because of its deeper flavor, I tend to reserve brown chicken stock for sauces and use white (or regular) chicken stock for soups, risottos, and other dishes. But you can experiment: try brown chicken stock in an onion soup or a sausage risotto, and you will surely enjoy the intense meaty flavor it provides. When making chicken stock (whether white or brown), prepare large batches, then freeze it in mason jars and defrost as needed. Or reduce your stock until it is thick and syrupy, almost like a glaze, then pour into ice cube trays, freeze until solid, and transfer to freezer-safe bags; the "ice cubes" of stock will need to be diluted with some water if used in soups, risottos, and other delicate dishes. 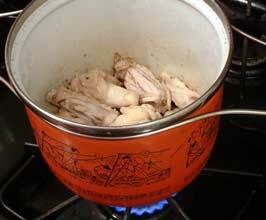 Place 2 pounds chicken wings, necks, and other bones in an 8-quart stockpot. Set pot over medium heat and cook 10 to 20 minutes, stirring once in a while, or until bones have taken on a rich color all over. 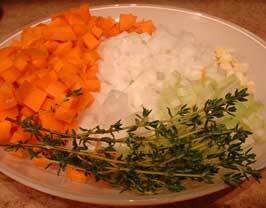 Coarsely chop the leek, carrots, celery, onion, and garlic. Add 2 thyme sprigs, 2 Italian parsley sprigs, 2 bay leaves, and 1 teaspoon black peppercorns to the chopped vegetables. Add the prepared vegetables and aromatic herbs from Step 3 above to the browned bones. Cook 5 more minutes, or until the vegetables soften, stirring often. Pour in enough cold water to cover bones and aromatic ingredients by 2 inches. Don't pour in too much water or the stock will taste weak and diluted. Bring to a gentle boil, reduce the heat to low, and simmer the stock, uncovered, for 2 to 24 hours, or until the stock is as reduced as you like it. 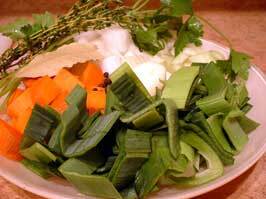 The longer you cook the stock, the more it will reduce and the deeper the flavor and color will be. Skim the surface of the stock with a slotted spoon to discard any scum that rises to surface once in a while. The cooked brown stock is ready to be strained. Place a fine mesh strainer over a bowl. 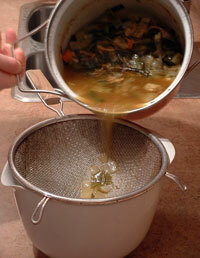 Pour the stock and solids into the strainer. To obtain the most intense flavor, press gently on the solids in the strainer with the back of a spoon. Discard the solids. Cool the stock to room temperature, then refrigerate until the fat solidifies at the top; scoop out the fat using a slotted spoon. Pour the defatted stock into clean jars and refrigerate up to 5 days or freeze up to 2 months.